The choice of which vocabulary to reuse when modeling and publishing Linked Open Data (LOD) is far from trivial. There is no study that investigates the different strategies of reusing vocabularies for LOD modeling and publishing. In this paper, we present the results of a survey with 79 participants that examines the most preferred vocabulary reuse strategies of LOD modeling. The participants, LOD publishers and practitioners, were asked to assess different vocabulary reuse strategies and explain their ranking decision. We found significant differences between the modeling strategies that range from reusing popular vocabularies, minimizing the number of vocabularies, and staying within one domain vocabulary. A very interesting insight is that the popularity in the meaning of how frequent a vocabulary is used in a data source is more important than how often individual classes and properties are used in the LOD cloud. Overall, the results of this survey help in better understanding the strategies how data engineers reuse vocabularies and may also be used to develop future vocabulary engineering tools. 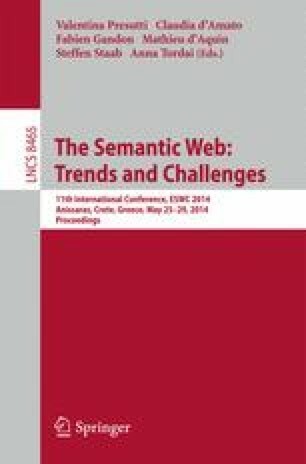 Schaible, J., Gottron, T., Scherp, A.: Extended description of the survey on common strategies of vocabulary reuse in linked open data modeling. Technical Report 01/2014, Institute for Web Science and Technologies, Universität Koblenz-Landau (2014) http://www.uni-koblenz.de/~fb4reports/2014/2014_01_Arbeitsberichte.pdf.